Cornelius seafood restaurant is a unique and popular dining destination on the north-west side of island Bjorøy, with spectacular views of the fjord and islands close to Bergen, Norway. 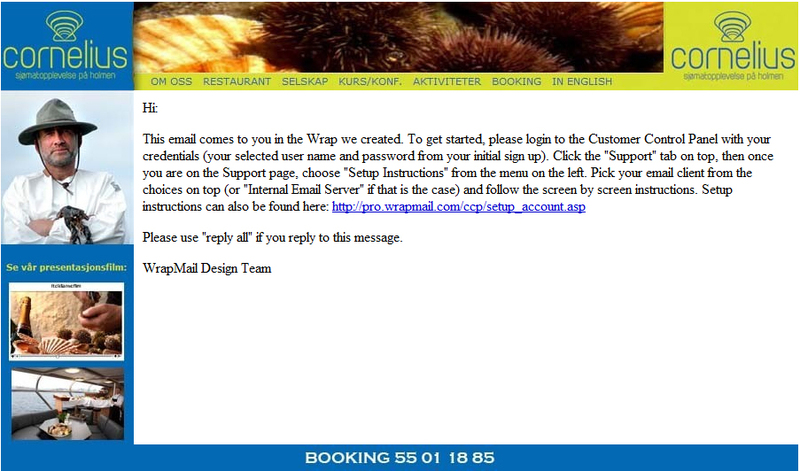 They have just signed up for WrapMail taking advantage of promoting the restaurant with every email employees send out every day. They will be able to feature new menus, special offers etc in the wrap and as with all WrapMail’s the images in the wraps have traceable embedded links to drive traffic to the website. 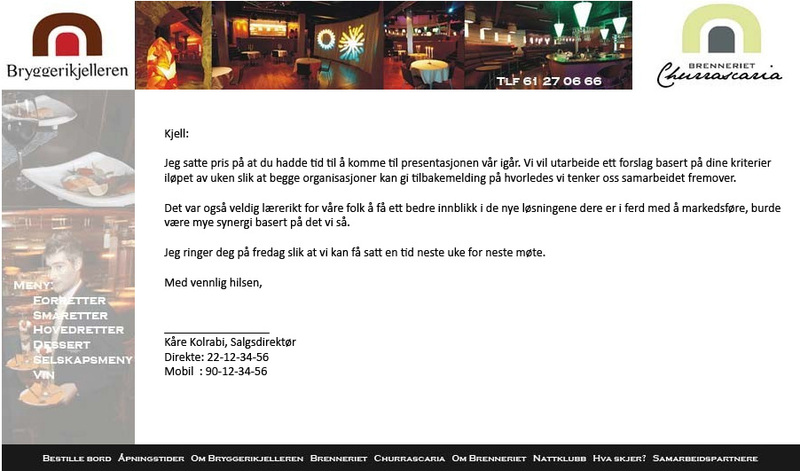 Another Restaurant in Norway sees the Value of WrapMails services to brand, cross-sell, upsell and make it easy to book reservations etc by simply using WrapMail to add an interactive letterhead to the regular outbound emails sent by employees. Bryggerikjelleren Restaurant er byens treffsted og holder til i en ølkjeller fra 1855. Vi er kjent for å ha byens beste a la carte meny, og her må man huske på å bestille bord for å få plass. Den lekre baren som ligger midt i lokalet er et populært møtepunkt for de som vil ta seg en øl eller Irish i et voksent miljø. Vi har også en stor vinkjeller. Ved siden av Bryggerikjelleren ligger Brenneriet Churrascaria – et unikt spisekonsept i Norge med grillet kjøtt som spesialitet. Hødd soccer club in Norway has already sold three advertising spots in their email wrap. Sparmax, Allweiler (Colfax) and the local Xerox dealer all have seen the value of advertising in emails sent from the Hødd-staff. The first advertiser was enough to eliminate the cost of WrapMail, the next two represent pure profit for the club. Quite a number of soccer clubs struggle financially and this is where WrapMail creates a hat-trick by branding the club, driving additional traffic to the website and generating a new revenue stream.